There’s still time to sow some of the most mouth-watering vegetables to enjoy a harvest this summer. The soil is warm and seeds are just desperate to get growing! If you’ve never tried growing your own before, there couldn’t be a better time to start than right now. Weed the area you want to grow in. Rake the soil so that the top inch or two (2.5-5cm) is nice and loose. Scratch out a shallow trench (known as a drill) about an inch (2.5cm) wide using the edge of a hoe or rake, a trowel, or your finger. Sprinkle your seeds along the drill. Cover the seeds over with garden compost if you have it (multi-purpose bagged compost will be fine too), or just backfill with your garden soil. Then stand back and let your seeds get on with what all plants specialise in: growing! 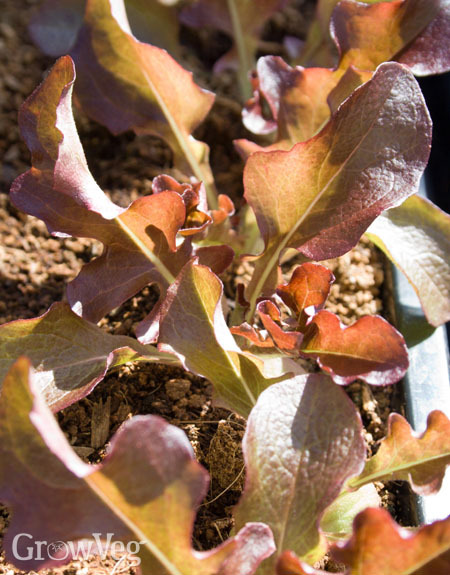 There are so many interesting varieties of lettuce that are fun and easy to grow! I’ve never known a garden that cannot grow lettuce. Lettuce won’t even mind a bit of shade, particularly in hotter climates. As well as being easy to grow, lettuce can be very attractive. An endless assortment of leaf shapes and shades of green and red means you’ll never get tired of growing new lettuce varieties. Cut-and-come-again (or leaf) lettuces are easiest, and you can enjoy several harvests from the same plant by just snipping off what you need each time. Cover your lettuce seeds with a thin layer of compost or soil. Once they’ve sprouted, thin out the excess so you’re left with one plant about every 4in (10cm). This will give them plenty of space to develop lots of luscious leaves. You can transplant the seedlings you’ve thinned into another spot in your garden if you want to, or just throw them on the compost heap if you’ve got plenty. I find that watering with a seaweed solution helps transplanted lettuces to find their feet and get growing again quickly. Seaweed concentrate is available in most garden centres. Sow a small number of seeds three or four times over a period of several weeks. This has the double advantage of spreading out the harvesting period so you can keep your lettuces cropping for longer and providing backups in case of any problems. Radishes are peppery little powerhouses that pack a real punch for your palate – and if that isn’t enough alliteration for you, they’re pretty too! Common varieties are usually red, or red and white, and look stunning whether sliced into salads or roasted whole. Sow each seed 2in (5cm) apart or more, or thin them to this spacing after they sprout. Radish seeds are chunky little spheres, so it’s easy to see exactly where you’re sowing. Cover the seeds with about half an inch (1cm) of compost or soil. Most gardens should be able to grow a decent crop of radishes with little fuss, but do check out Barbara Pleasant’s article 8 Truths About Growing Radishes to avoid any problems. Expect to be able to start harvesting your first small roots within about six weeks. Beetroot leaves can be eaten as well as a the delicious roots! You haven’t lived until you’ve tasted beetroot you’ve grown yourself. I mean it! Nothing compares to garden-fresh beetroot, boiled or roasted until tender. The quirky seed capsules contain two or three beetroot seeds, so the seedlings will always need to be thinned. Sow the seed capsules about an inch (2.5cm) deep, and 4in (10cm) apart. Harvest the roots at any time up until they’re the size of a tennis ball. While you’re waiting for them to plump up, why not try a few of the leaves? They can be used just like spinach, giving you two harvests from one plant. For each of these three easy crops, there are three potential problems to look out for to make sure nothing stands in the way of your successful harvest. Slugs are notorious lettuce-munchers, and will carve little holes into radishes and beetroots too. Slug-damaged roots can still be eaten, but slugs they become a burden, lure them into beer traps to help reduce their numbers. Weed competition and long spells of dry weather can result in the soil drying out. If plants don’t have enough water, the leaves will wilt. A good drenching can often revive them if done soon enough – do this as soon as you notice any signs of wilting. Bolting is the gardener’s term for running to seed. When this happens, lettuce leaves will turn bitter and the roots of radishes and beets will become tough and unpalatable. Drought stress and sowing too early are two main causes. Our Garden Planner can provide recommended sowing times for your location to help you avoid this. Once you’ve enjoyed growing these easy crops, you’ll have gained valuable growing experience and laid a solid foundation for further gardening experiments. How about growing peas? They’re not too difficult. Garlic and onions could be planted this autumn, for a fuss-free crop next year. Or maybe you’d like to try your hand at some homegrown fruits for making delectable desserts. And why not try our Garden Journal to keep track of your growing experiences? It’s free to use and will help you to build up a record of what works and what doesn’t in your own unique garden. "Hi Ann Marie, I always enjoy your posts. My biggest problem with sowing seeds is the watering bit - but how to if you can't ]get to the garden quite every day? I usually manage every second (third at a pinch) and we have Dutch clay. Do you have any tips? I mulch as often as I can. Thanks, in advance, Veronica "
"Aw, thanks Veronica, I'm glad you're enjoying my posts! It can be tricky to keep soil watered enough if the weather is very hot. However, in all but the hottest areas, every second day should be more than sufficient as long as you water deeply enough. Sometimes daily watering can be too much and cause seeds to rot, so don't feel that it's always necessary. Be guided by the soil; poke a finger in or dig a small hole with a trowel near your seeds to check how moist it is beneath the surface. When mulching, do it after a good watering or rain to help lock soil moisture in for longer. I hope that helps!"